Hey Everyone! I create a new blog called Bruce Bucks! Please come join me on my new site, as I will be posting new blogs from there moving forward. Please feel free to follow me on twitter as well and I will gladly follow you. I look forward to sharing my new blog with you. Let me know your feedback. Hey everyone! I created a new blog! Please come follow me at www.brucebucks.com. Sorry all you readers, but I am going to ramble about my money situation again. The main goal right now is to pay off our Student Loan debt. My wife just recently got a teaching contract for the year, so we are excited about the consistent income that will come in throughout the year. We believe that we can make good progress on paying off our student loan, but we have to stay focused. Once we start making more money it is easy to relax and think we have arrived, but we have a long way to go. The last three months we have only been able to throw $200 at our loan, and it makes you feel like you are not moving anywhere. Do any of you ever feel like your in a financial ditch? I am in it right now. The goal during this next month is to put a plan in place that will lay the ground work for paying off our student loan. We have to try to plan for most expenses coming up this year. The fall brings about more expenses with Christmas on the way. Traveling to see family is going to cost us $1000, and that does not even include the gifts. Those of you who have saved all year for your Christmas fund, hats off to you. Here are my goals for this 2010- 2011 year. Save $5,000 for our emergency fund. Pay off $10,000 in student loan debt. These goals may sound simple for many of you out there, but this would be a huge accomplishment for us. I will use this blog to monitor our progress and if all you could please keep me accountable to them. What savings plans do you have in place for this year? I know 2010 is almost over, but what do you hope to achieve financially, or in your personal life? I have to announce that I have been so proud of my wife lately! We recently moved into a new condo, (new for us, not a newly built condo) to check it out click here, and my wife has happily been decorating it fairly inexpensively. All our furniture was found on craigslist for a fraction of the original price. Her new hobby is searching for deals on craigslist. 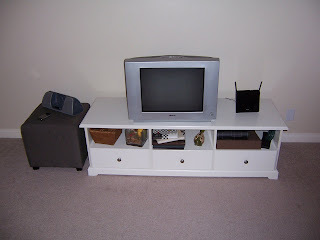 The reason I am proud is because we currently have a older TV on our entertainment piece (I think that is what she calls it), and it is more than obvious that the TV is too small for the piece of furniture. This piece of furniture was built to perfectly hold a 46" Samsung LED TV, but currently we have settled for a 22" memorex wanna be flat screen. We could have easily gone out and bought a brand new flat screen TV with one of our credit cards, or signed up for a 0% interest for 12 months deal, but we decided to wait and pay cash. My wife and I both know that once we get a flat screen, we will eventually want cable, then HDTV, then a Blue Ray player, and on and on. We want to be able to afford these small luxuries without getting in over our heads. Some of you might be thinking, why do you even need a flat screen? We don't need one truthfully, but it is something that we want to save up for. Just like many of you who went out and bought a new macbook pro. It is a luxury, but not a necessity. My wife loves decorating and making our place feel like home and this TV has been ruining the entire feng shui of our condo. I am proud of her for being patient with me as we save up for it. Our place does not look perfect in her eyes yet, but one day soon. A little delayed gratification will make it so much better to walk out of the store with a paid for flat screen TV. What are the small luxuries in your life that you had to save up for? Was the delayed gratification worth it? Thanks for stopping by, I would love to hear your comments.